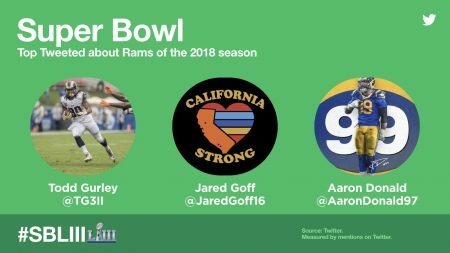 The National Football League season reaches its end with Super Bowl LIII Feb. 3, and Twitter shared some data about the two teams who will be facing off: The New England Patriots and Los Angeles Rams. 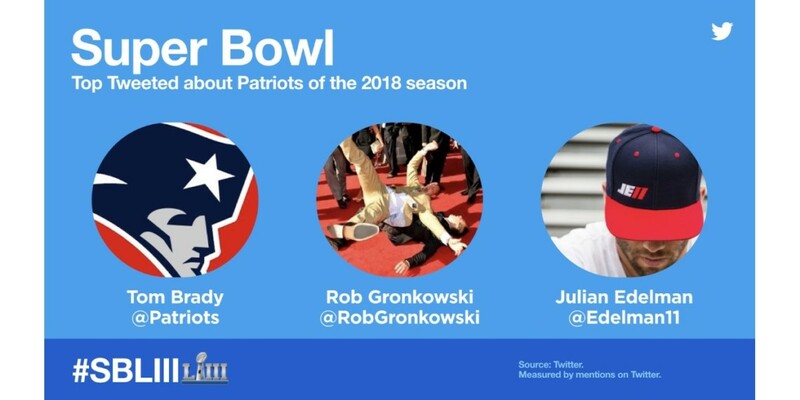 While the Patriots and Rams are facing off for the Vince Lombardi Trophy, neither club came close to claiming the Twitter crown, as they finished fifth and 15th, respectively, in 2018 Twitter mentions among NFL teams. The top four were the Pittsburgh Steelers, Dallas Cowboys, Cleveland Browns and Philadelphia Eagles. Patriots quarterback Tom Brady was the most-tweeted-about player during the 2018 season and postseason, tallying almost 3 million mentions. Jan. 20: Running back Rex Burkhead runs for a two-yard touchdown in overtime, sending the Patriots to the Super Bowl. Jan. 20: Burkhead runs for a four-yard touchdown with 39 seconds remaining in the AFC Championship game, giving the Patriots a 31-28 lead over the Kansas City Chiefs. Jan. 20: Brady throws a fourth-quarter interception during the AFC Championship game. Jan. 20: Kicker Greg Zuerlein kicks a game-winning 57-yard field goal in overtime to send the Rams to the Super Bowl. Jan 12: The Rams defeat the Cowboys 30-22 to advance to the NFC Championship game. Nov. 19: The Rams defeat the Chiefs 54-51 on Monday Night Football. During the NFL season, from Sept. 6 through Jan. 23, the Patriots saw follower growth of 4 percent on Twitter, reaching 4,375,070, while the Rams’ follower count rose 13 percent to 818,320.
Who got Mackenzie Bezos IG or Twitter???? ?